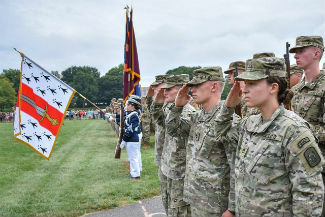 Cadet Hunter Tettelbach, second from right, stands at attention with the rest of Golf Company’s training cadre in front of the first-year cadets during the New Cadet Parade on Aug. 18. Virginia Tech cadet Hunter Tettelbach will receive the flags at the Hokies’ season opener against Florida State. The cadets, also selected based on their performance during training, render honor to the flags and then carry them off the field. At home games three first-year cadets are selected, and one or two upper-class cadets travel with the team and receive the flags at away games. Tettelbach, a junior in Naval ROTC majoring in environmental science in the College of Agriculture and Life Sciences, was chosen for his enthusiasm while training first-year cadets during New Cadet Week. Cadet Brett Smith, a senior in Air Force ROTC majoring in physics, who commands the corps’ Golf Company, where Tettelbach is a staff sergeant, said Tettelbach is driven and full of energy.